The Lynde and Harry Bradley Foundation has been called "the country's largest and most influential right-wing organization" because of the volume of grants it distributes each year, a large number of which go to supporting a network of neoconservative-led groups. However, in terms of total assets, the foundation barely makes it onto the list of the largest 100 foundations in the United States. At the end of 2013 it had $922 million in assets, making the 91st largest. From 1985 to 2012, the total value of the foundation’s contributions was roughly $827 million. Some of the foundation’s grantees—notably the Hudson Institute, the American Enterprise Institute (AEI), and the Heritage Foundation—have played important roles shaping public discourse on U.S foreign policy, although the foundation's priorities tend to be domestically oriented. For instance, the foundation helped lead the right-wing campaign to have the government support faith-based programs, an effort that President George W. Bush praised in July 2002 at the Milwaukee Holy Redeemer Institutional Church of God in Christ—a Bradley grant recipient. Based in Milwaukee, the foundation is seen as a close ally to Wisconsin Gov. Scott Walker, who is widely considered a leading potential candidate for the 2016 GOP presidential nomination. Michael Grebe, Bradley’s executive director and CEO, has served as either the chair or co-chair of Walker’s election campaigns in 2010, 2012, and 2014. Grebe is also a retired partner of the Foley & Lardner law firm, whose clientele has included prominent Republican organizations and figures, like Florida Senator and 2016 Republican presidential candidate Marco Rubio. Grebe previously served as a Republican national committeeman for Wisconsin and was a state co-chairman of Ronald Reagan’s 1984 presidential campaign. Despite these connections, Grebe has said he is “very careful” to keep the Bradley foundation out of partisan politics. “I don’t make political calls from the foundation office. I do that from home or from campaign offices. I won’t let the foundation get mixed up in partisan politics,” he has said to Philanthropy Roundtable, a conservative organization whose board he chairs. Some analysts have said Bradley will be a strong supporter of Walker’s potential 2016 presidential bid. “Bradley and Grebe were central to Walker’s rise to national prominence four years ago, when he rolled back the power of government unions. They’ll probably be equally key to his almost-certain presidential bid,” opined John McCormick in a March 2015 piece for Bloomberg. In 1903, Lynde Bradley and Stanton Allen founded what would become known as the Allen-Bradley Company, a manufacturer of rheostats—instruments that controlled electrical currents—in Milwaukee, Wisconsin. Lynde's brother Harry became a co-owner. After Lynde died in 1942, his assets were used to create the charitable Lynde Bradley Foundation. In 1985, the instrument company was sold to Rockwell International, and much of the proceeds went to the foundation, which had by then changed its name to the Lynde and Harry Bradley Foundation. Harry Bradley belonged to the right-wing John Birch Society and was a frequent contributor to the National Review. Both Lynde and Harry were conservative philanthropists who believed in "American democratic capitalism" by way of "free representative government and private enterprise." Thus, Bradley's programs "support limited, competent government; a dynamic marketplace for economic, intellectual, and cultural activity; and a vigorous defense at home and abroad of American ideas and institutions." Beginning in the late 1970s, Bradley played an important role in fomenting neoconservatism through its support of AEI, often considered home base for that political faction. Commenting on this period, Irving Kristol, a key intellectual architect of neoconservatism, writes that AEI's efforts to recruit neoconservatives in the 1970s and 1980s was "facilitated by the appearance on the scene of a rejuvenated Bradley Foundation and John M. Olin Foundation." Michael Joyce, described by Kristol as "an accomplished neoconservative thinker in his own right," served as president of the Bradley Foundation from 1985 to 2001; he had earlier been president of the now-defunct Olin Foundation. Hillel Fradkin is a past Bradley vice president, and William Kristol, son of Irving, served as a project director at the foundation in the early 1990s. Bradley’s 2013 annual report highlights six major areas the foundation has concentrated is funding efforts on: civil society, education, law and society, national defense and foreign policy, public discourse, and public policy research. Many of Bradley's grantees are among the leading organizations of the right wing, particularly among neoconservatives, some of which played instrumental roles in shaping and promoting the "war on terror" policies of the George W. Bush administration. In 2013, Bradley gave money to a host of neoconservative organizations and other groups espousing hardline foreign policy nationalism, including: American Enterprise Institute, Hudson Institute, Manhattan Institute, Heritage Foundation, Federalist Society, Institute on Religion and Public Life, Ethics and Public Policy Center, American Foreign Policy Council, Foundation for Defense of Democracies, Foreign Policy Research Institute, the Institute on Religion and Democracy, Hoover Institution, among many others. Government-connected institutions also obtain grants from Bradley. The National Endowment for Democracy received $80,000 in 2007 in part for the publication of The Journal of Democracy, and the International Republican Institute received $26,000 in 2003. Past grantees have included the neoconservative Project for the New American Century ($200,000) and Marquette University, which received $20,000 for a research project on Norman Podhoretz. The Bradley Foundation has also been cited as a sponsor of the “Islamophobia network” in the United States. According to a 2011 report by the Center for American Progress, Bradley has funded an array of groups promoting Islamophobia and militaristic U.S. foreign policies in the Middle East, including the David Horowitz Freedom Center, Frank Gaffney’s Center for Security Policy, and Daniel Pipes’ Middle East Forum. Bradley supports Encounter Books, a conservative publishing house, by funding Encounter for Culture and Education, Inc., giving it more than $1 million in 2007 alone. Encounter's most popular titles include David Horowitz's Indoctrination U.: The Left's War Against Academic Freedom; Willful Blindness: A Memoir of the Jihad, by Andrew McCarthy of Foundation for Defense of Democracies; Londonistan, by Melanie Phillips; and Climate Confusion: How Global Warming Hysteria Leads to Bad Science, Pandering Politicians and Misguided Policies That Hurt the Poor, by Roy Spencer. The foundation annually distributes up to four $250,000 prizes to "innovative thinkers and practitioners whose achievements strengthen the legacy of the Bradley brothers and the ideas to which they were committed." Past recipients have included Victor Davis Hanson, John Bolton, Robert George, Mary Ann Glendon, Leon R. Kass, and Charles Krauthammer. Foundation Center, “Top Funders,” http://foundationcenter.org/findfunders/topfunders/top100assets.html. Daniel Bice, Bill Glauber, and Ben Poston, “From local roots, Bradley Foundation builds conservative empire,” Journal Sentinel, November 19, 2011,http://www.jsonline.com/news/milwaukee/from-local-roots-bradley-foundation-builds-conservative-empire-k7337pb-134187368.html. Jeff Krehely, Meaghan House, and Emily Kernan, Axis of Ideology: Conservative Foundations and Public Policy, National Committee for Responsive Philanthropy, March 2004, pp. 61-62. "President Bush Visits Holy Redeemer in Milwaukee, Touts 'Faith-Based' Social-Services Work There," Bradley Foundation Press Releases, July 2, 2002. Lank, Avrum D., "Foley and Lardner chairman influences from inside," Milwaukee Journal Sentinel, January 21, 2001,https://web.archive.org/web/20070419002833/http://www2.jsonline.com/bym/news/jan01/grebe22012101a.asp. Philanthropy Roundtable, “Michael W. Grebe,” http://www.philanthropyroundtable.org/who_we_are/board/michael_w_grebe. Betsy Woodruff, “Inside Scott Walker’s Secret Brain Trust,” The Daily Beast, April 16, 2015, http://www.thedailybeast.com/articles/2015/04/16/inside-scott-walker-s-secret-brain-trust.html. Rockwell Automation, "Who We Are: Our History," http://www.rockwellautomation.com/global/about-us/history/overview.page?. The Lynde and Harry Bradley Foundation, “About the Foundation,”http://web.archive.org/web/20060930140952/http:/www.bradleyfdn.org/ourhome/About.html. Buying a Movement: Right Wing Foundations in American Politics (Washington, DC: People for the American Way, 1996),http://www.pfaw.org/sites/default/files/buyingamovement.pdf. 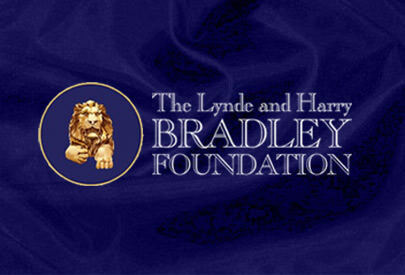 The Lynde and Harry Bradley Foundation, "The Bradley Foundation's Mission," http://www.bradleyfdn.org/foundations_mission.asp. Bradley Foundation Press Release 4/01, June 2002. The Lynde and Harry Bradley Foundation, “Program Interests,” http://www.bradleyfdn.org/What-We-Do/Program-Interests. Bradley Foundation, 2013 Annual Report, http://www.bradleyfdn.org/Portals/0/pdfs/Report2013/2013%20Annual%20Report%20(I).pdf. The Lynde and Harry Bradley Foundation, "2007 Annual Report," p. 21, available at http://www.bradleyfdn.org/annual_reports.asp. The Lynde and Harry Bradley Foundation, "2003 Annual Report,” http://www.bradleyfdn.org/What-We-Do/Annual-Reports. Eli Clifton, “Meet An Islamophobia Network Donor: The Lynde And Harry Bradley Foundation,” ThinkProgress, August 30, 2011,http://thinkprogress.org/politics/2011/08/30/307525/bradley-foundation-islamophobia/. The Lynde and Harry Bradley Foundation, "2007 Annual Report," p. 25, available at http://www.bradleyfdn.org/annual_reports.asp. Lynde and Harry Bradley Foundation, "Encounter Books," http://www.bradleyfdn.org/encounter_books.asp. "The Bradley brothers were committed to preserving and defending the tradition of free representative government and private enterprise that has enabled the American nation and, in a larger sense, the entire Western world to flourish intellectually and economically. The Bradleys believed that the good society is a free society. The Lynde and Harry Bradley Foundation is likewise devoted to strengthening American democratic capitalism and the institutions, principles, and values that sustain and nurture it. Its programs support limited, competent government; a dynamic marketplace for economic, intellectual, and cultural activity; and a vigorous defense, at home and abroad, of American ideas and institutions. In addition, recognizing that responsible self-government depends on enlightened citizens and informed public opinion, the Foundation supports scholarly studies and academic achievement."